The holidays are upon us, and Auduboners are in a festive mood! Join us for our annual Holiday Slide Show and Social, 7 p.m., Thursday, Dec. 8, at the KCEF Branch Library, Price Park in Greensboro. Please don’t bring any food. Our chapter will provide lots of holiday goodies to eat and drink again this year. The program will be great! We are sticking with our tradition of having a program made up entirely of members’ nature photos. Please bring your photos of birds, butterflies, wildflowers…and, of course, people watching them. Your photos can be from our monthly nature walks, people enjoying field trips, or shots of critters in your own back yard. (No general travel or family photos, please.) About 25-30 will be plenty, but you can bring fewer. Be sure that your photos are on a flash drive. Photo RSVP: We need to know who is bringing photos and how many to count on in order to plan the timing of our meeting. Consequently, we are requesting that you give us a “photo RSVP.” Contact the program coordinator, Dennis Burnette, at deburnette@triad.rr.com, 336-299-4342. We would appreciate you letting us know you’re bringing photos by Monday, Dec. 5th. Please plan to join us for this fun holiday celebration. We hope to see you on December 8...and remember to send your photo RSVP BY Dec. 5! Come help us from 10 a.m. to noon Wednesday, Nov. 9, at the first workday to tackle the growing problem of invasive species of plants that are causing problems in the Audubon Natural Area. Tools will be provided, but bring gloves and wear comfortable work clothes and shoes. Meet at the entrance to the ANA on Tankersley Drive behind Cone Hospital. 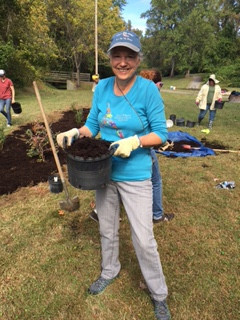 TGPAS helped plant native plants along part of the High Point Greenway and staffed an information table on Sunday, Oct.16. 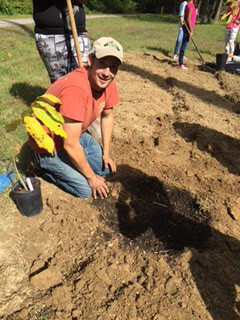 Ralph Soviero of Soviero's Tri-County Garden Center of High Point coordinated this event focusing on installing native plants at High Point Greenway near the High Point Museum. More than 30 volunteers and students planted three areas. TGPAS members Sarah Gilley and Stella Wear spoke with a local video show host from the City of High Point. Welborn Middle School teacher, Mr. Ollison, expressed interest in a bird presentation. At least a dozen students participated in planting. Jim Eldrett and Lynn Allison put in some quality time at the Audubon Natural Area on the afternoon of Saturday, Oct.22. It was a perfect day for working outside; clear and crisp with a nice breeze. Trail clearing and pruning were the main activities of the day. Hand pruners, shovels and a saw came in handy. Jim also used a long iron crow bar and a short sledge hammer in making progress deconstructing railroad ties left from the Eagle Scout project. The new benches were "tested" to make sure they were in good working order. As they worked, a Kingfisher coursed up and down Buffalo Creek. Blue Jays and Red-bellied Woodpeckers also took part in the conversation. Jim’s dog, Sadie, added moral support as she munched happily on an Odocoileus virginianus tibit that she discovered in the brush. Nearly 170 species that breed, nest, migrate or winter in North Carolina are at risk. You can help these birds survive by supporting programs right here in North Carolina. Brown-headed Nuthatches, American Oystercatchers, Golden-winged Warblers and hundreds of other species need your help. Audubon North Carolina's goal this year is to raise $50,000 by Dec. 31, 2016 to further the work needed to protect North Carolina’s birds in the coming year. Saving Wild Places…Saving Ourselves ? Who: Tom Earnhardt, Host of UNC-TV's "Exploring North Carolina"
Across North Carolina the oaks, maples, pawpaw, dogwood and pines of a generation ago have given way to crape myrtle, Asian elm, and a host of non-native shrubs and flowers lining our highways and residential communities. If we really care about the birds and countless critters that cal North Carolina home, we must preserve their habitats, including stream corridors. The paragraph above is Tom Earnhardt's description, and it fits perfectly with Audubon's Native Plants for Birds initiative, which TGPAS members have been committed to for the last several years. We will explore with Tom how we all can contribute to “saving wild places and ourselves." Tom Earnhardt hardly needs an introduction, so we'll give just a few details of his background here. Tom is a lawyer who has worked both inside and out of government for the environment, helping to preserve land for Cape Lookout National Seashore and the New River. He was a college professor and taught environmental law. In his other life he has been active with many conservation groups, including Audubon NC where he served on the state board of directors. He is perhaps best known for his UNC-TV series "Exploring North Carolina," which has been nominated for five Emmys. 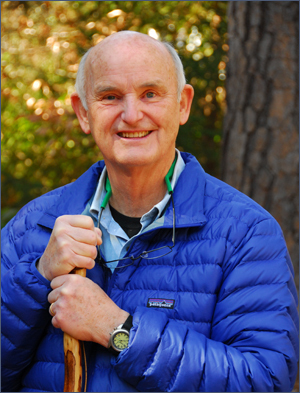 For his work in conservation Tom has received The Order of the Long Leaf Pine in 2011 and the Governor's Conservationist of the Year award in 1994. We are pleased and privileged to welcome Tom Earnhardt to Greensboro and to have him speak to us about the work in which we are all engaged. Please join us on Nov. 10, and plan to arrive 15 or 20 minutes early to chat with Tom over some snacks and drinks. As an added bonus, you will be eligible for a great door prize, Tom's new book. This scenic greenway was constructed on the abandoned Atlantic & Yadkin (A&Y) railroad bed. The name reflects the greenway's past as an active railway from Mount Airy southeast to Sanford, NC. Join as we meander south along the A&Y towards the Weaver Bridge. We will look for hawks, Great Blue Herons, egrets, ospreys, and several duck species as we walk in the shadows of mixed hardwoods and pines. We will take a break at the Weaver Bridge to enjoy the beauty of Lake Brandt and some fall foliage. Meet 1:45 p.m. next to Friendly Avenue in the Whole Foods parking lot, 3202 W. Friendly Ave, Greensboro. If you would prefer to meet us at the site, we plan to be there about 2:15 p.m. Contact the leader, Courtenay Vass, at ackctv@aol.com, if you have any questions. Involvement with community outreach is an important part of Audubon's mission. A perfect example of this was the completion of an Eagle Scout project this summer at our Audubon Natural Area. Scout Jalen Burney of Troop No. 723 can now claim the title Eagle Scout after coordinating a large team of volunteers at the site. The team installed two benches along the Tom Hillmer Memorial Trail. One bench is located in the woods and overlooks a portion of Buffalo Creek, while the other sits along the back section of the trail along the right-of-way, where the open meadow area, as well as the woods edge on the far side can be viewed. Good spots for a Big (or little) Sit, or to take a break on a workday when no one's looking. (Jack almost caught me last time). 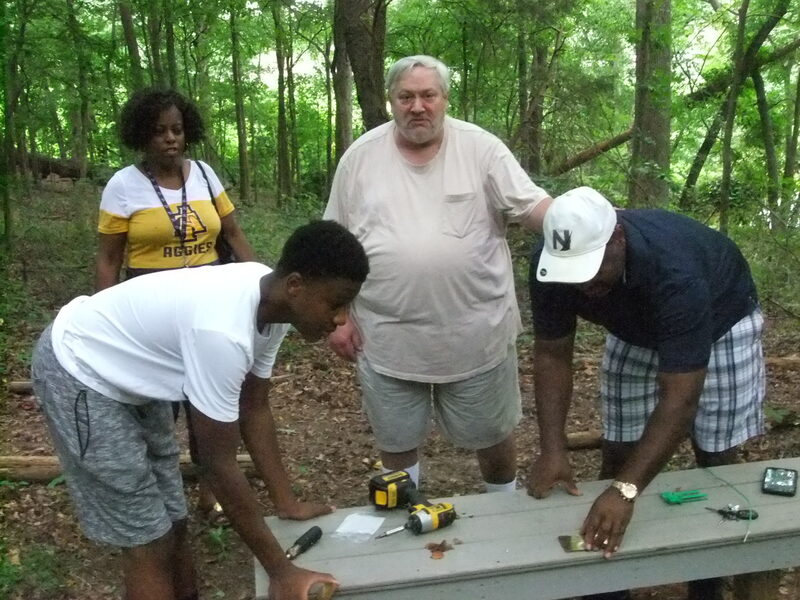 "In the months of July and August 2016, my team and I built 2 benches…along the Tom Hillmer Memorial Trail.,” Jalen says. “The benches became an enhancement and an added amenity which will encourage walkers to stop look and listen to nature…We had to work a little harder to finish the project…That is just a small price to pay in order to get the job done. Despite of all the extra work, it paid off in the long run when I saw how satisfied Mr. Eldrett was." Satisfied indeed. The next time you visit the area, give the benches a test drive, and I think you'll agree. Many thanks to Jalen and his team, in particular his parents, Sheldon and Anita Burney, who showed great dedication and involvement in the project from start to finish. A future that includes a healthy environment depends on habitat preservation, public awareness, and developing an environmental ethic among our youth. This project was a win-win on all fronts. We are most grateful to Jalen and his team for their contribution. I look forward to attending Jalen's Eagle Scout Court of Honor on Audubon's behalf. Photo of Jalen Burney (front left); his mother, Anita Burney; Jim Eldrett; and Jalen's father, Sheldon Burney. 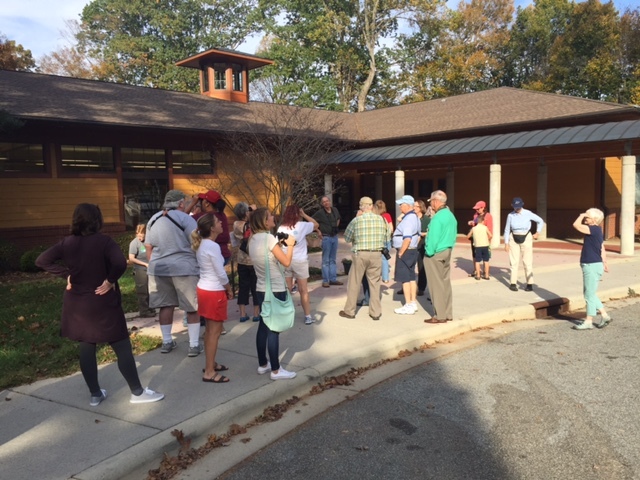 We had a great turn out of 39 folks for our Beginning Birder Workshop, titled “Introduction to Birds and Birding,” on Sunday afternoon, Oct. 30. This first of three workshops focused on how to get started watching and identifying birds. It began with a 45-minute indoor class, followed by bird identification practice outdoors. It was conducted by Dennis Burnette. We had several experienced birders on hand that served as mentors to answer questions and give practical tips. Thanks to Lynn Allison, Jim Eldrett, Sarah Gilley, Lyn McCoy, Jim Strickland, and Emily Tyler for sharing their knowledge with our new birders. This series of beginning birder workshops is co-sponsored by the T. Gilbert Pearson Audubon Society and the Piedmont Bird Club. In addition to members of those two groups, the general public is invited to attend the next two workshops. The level is suitable for adults and supervised older kids, so participants are welcome to bring family and friends. The topic of each of these workshops will be different. A participant may attend one, two or all three and receive different material each time. Each workshop will involve a classroom presentation and discussion followed by about 45 minutes of practicing birding skills. The workshops are at the KCEF Branch Library, Price Park, 1420 Price Park Rd., Greensboro. March 26, 2017, Sunday, 2:30-4:30, KCE Family Branch Library, “Familiar Birds of our Lawns and Parks.” This workshop will focus on building bird identification skills followed by a bird walk in Price Park to practice seeing typical identification field marks on common birds. 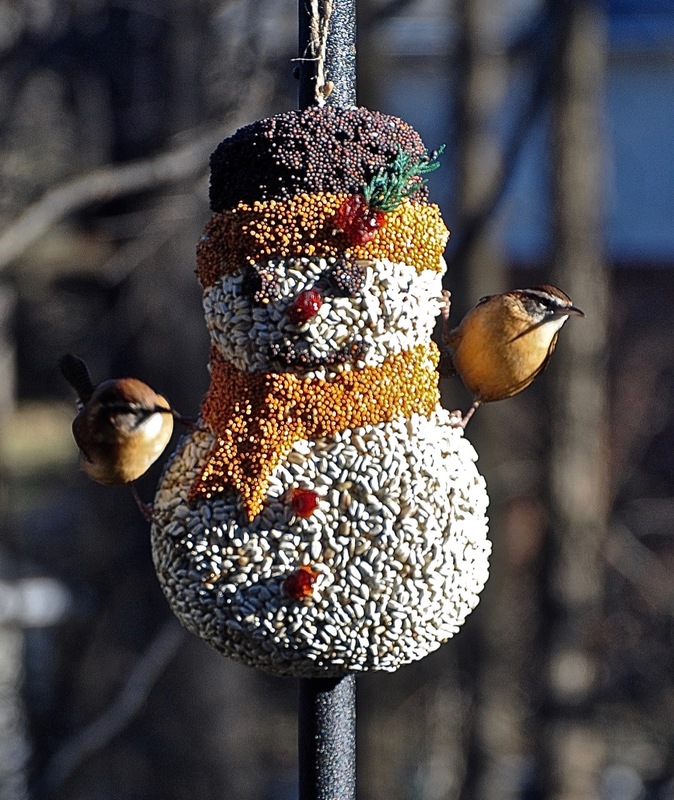 April 23, 2017, Sunday, 2:30-4:30, KCE Family Branch Library, “Attracting Birds to Your back Yard.” This will be a workshop about styles of bird feeders and types of bird food, including a variety of seeds, suet cakes and balls, and fruit. It will be followed by observation of nearby bird feeders.